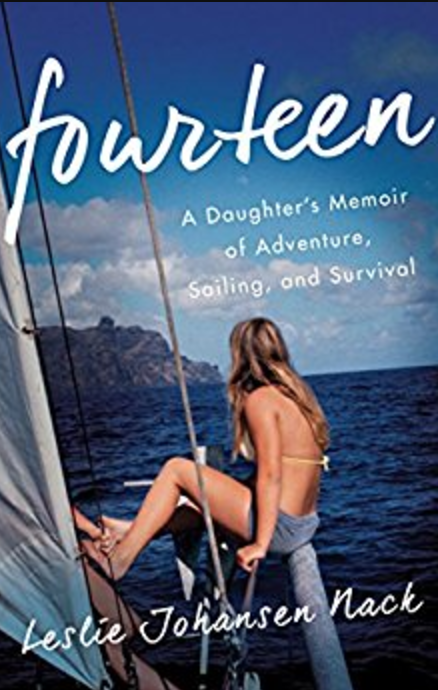 This coming-of-age tale of three years in the life of Leslie Johansen, from age 12 to 15, centers on her father’s planned around-the-world sailing adventure with Leslie and her two sisters, one older and one younger, as his crew. Leslie’s father had sole custody of the three girls after the parents divorced when Leslie was seven. His changeable moods challenged all three girls, but as his favorite, a label that Leslie alternately was proud and ashamed of, the brunt of his attention fell on her. Father and daughters spent two years to ready the 45-foot sailboat, Aegir, with Dad training the three girls to handle the boat in all types of situations. In 1975, they set sail from Oceanside, California, heading for Tahiti. Leslie Nack courageously shares with her readers her teen fears, dreams, and discouragements both before the family set off on their trip and during the days and nights they were confined to the 45-feet length of the ship. Her descriptions of the ocean’s many facets made me feel as though I were on the ship with her through the rain, storms, and even the doldrums. She provided just enough sailing terminology to ensure I respected her experience without confusing me – a non-sailor – so I could enjoy, or fear, the experience with her. Even her conflicting and alternating feelings of love and fear of her father resonated with my memory of my 14-year-old self. A real page-turner from beginning to end. Leslie will be one of three debut memoir writers on a panel at the San Diego Writers/Editors Guild on Monday, March 28, 2016, at 6:30 p.m.
It’s summer in Marin County. Seventeen-year-old Rosie is getting ready for her senior year, making horrible choices which lead to lies and manipulation. But her mother and step-father have their own problems. Both recovering alcoholics–or worse–Elizabeth doesn’t want to see Rosie’s drug use and promiscuity, and James sees it but doesn’t want to upset his relationship with Elizabeth. The only likable characters in this book were the bit players–Elizabeth’s friends, Rae and Lank, and Rae’s pastoral boss, Anthony. I tried very hard to like this book because it was loaned to me by a friend who supports my own writing attempts. But if I have to write stories like this one to succeed, I’ll fail. I wanted to slap the three main characters to wake them up, to make them stop repeating the same lies, the same acceptance of the lies, the same manipulation of friends, the same being manipulated by friends. Maybe it is because my own teenage years and my parents’ reactions to my form of rebellion were so very different from Rosie’s and her parents’. I could not sympathize or empathize with any of the characters. “Powerful and painfully honest. . .Lamott’s observations are pitch-perfect.” So says The New York Times, according to the book’s cover. Lamott’s prose is excellent. I could visualize Elizabeth’s exhaustion at trying to save Rosie and James’s frustration with Elizabeth’s lack of willingness to see, hear, and recognize the truth of what was right in front of her. But this was a book with a bloated middle. Even more frustrating is that there really wasn’t an ending, just a transition to what may turn out to be another book. It was my hope for a resolution to the gnawing repetition that kept me turning pages. I haven’t read anything else by Lamott. After reading this one, I’ll not likely seek out another. In the end, I was left. . . .